30th September and I'm riding along the Caledonian Canal towpath, in the dark, returning from a little exploratory ride after work. 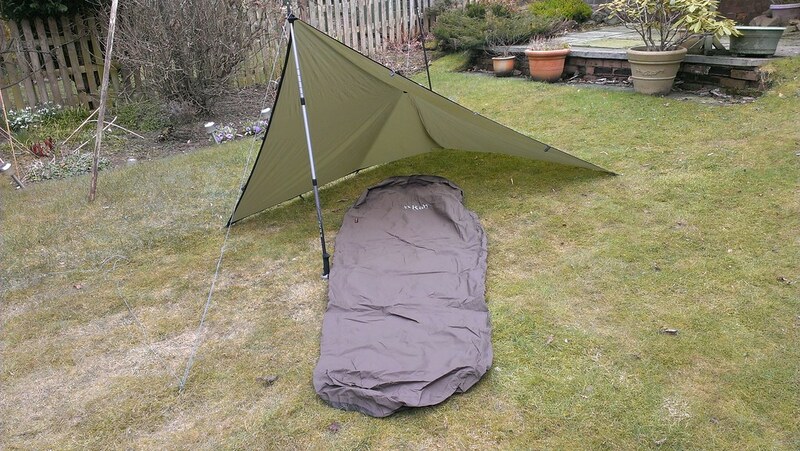 It suddenly occurs to me that it's the end of the month and I haven't been out for my obligatory bivvy. Obligatory. That's the exact thought that went through my head. 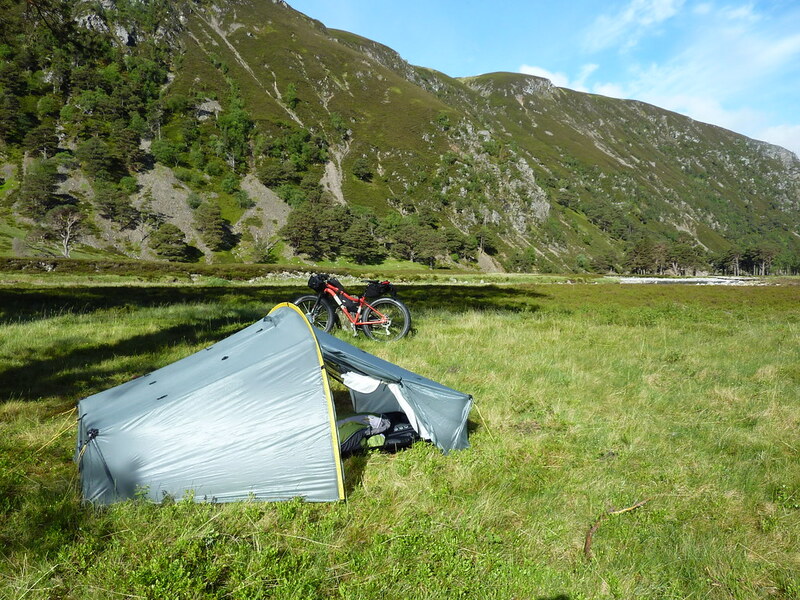 I quickly considered how I could get back home, grab all my gear and head out for a wee walk or ride and complete month 21 of my self-imposed bivvy-a-month target. However, the more I thought about it, the more I came to realise that it would just have been a box-ticking exercise. Up until then, all my bivvys (or camps or bothy nights) had some sort of background to them. They were in places I'd considered visiting or had a specific view or outlook I wanted to experience. As a result I opted to miss this one and, having done so, seemed to somehow skip October and November too. Partly that was due to feeling a bit under the weather, which turned out to be early-stage Lymes Disease (or perhaps from the side-effects of the subsequent anti-biotics) and partly due to a general lack of enthusiasm. In any case, since November I'd been slowly working myself back up to a better monthly mileage when a comedy slide had me off the bike and I bashed my shoulder. The fall itself was nothing. A wee bit of lack of attention, a bit of pine-needle covered mud and the front wheel just slid away from me. By the time I had it back under control I was heading for the trees and I decided to bale out. Lying on the path I looked back at the bike to see it sitting perfectly balanced upside-down, as if some naughty trail fairy had tried to cover up the results of up his (or her) booby trap. The ride back home was slow and steady as the pain gradually got worse and after a week or so of ooh-ing and aah-ing every time I reached for something or sneezed, I decided it was time to see the GP. She quickly diagnosed a broken rib (2nd or 3rd down), prescribed some painkillers and told me it would be 4-6 weeks for recovery. So, here I sit, watching the first decent snowfall of the season, unable to cycle, unable to ski (uplift passes are here!) and now reflecting on all those opportunities for nights out that I let slip away though delay and indecision. I guess this enforced break has at least re-kindled my enthusiasm for some more overnighting and I can use the convalescence time to start re-creating a bucket list of venues and goals. More islands I think, some more coastline and also taking some time to re-discover more old tracks now that many old favourites are being ridden more regularly. I'm not one for New Years Resolutions, but that's beginning to shape up like one. It seems to me that there has been an enormous increase in the variety of ways folk are enjoying the countryside these days. Where once upon a time we thought mainly of hillwalkers, we've seen the explosion in mountain biking, then the wave of kayakers and canoeists. Skiing became snowboarding and folk are now taking to the air in wingsuits. For some, even this isn't enough and they need to combine two or more of these activities in search of another angle. 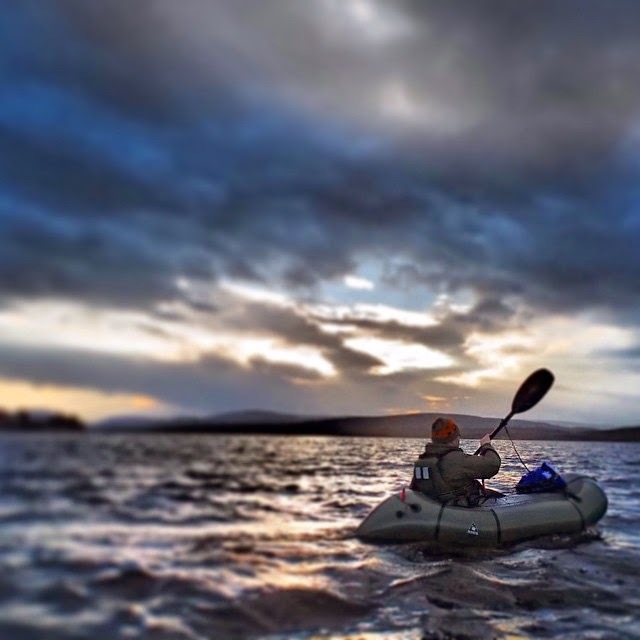 From my recent experiences, I've seen that lightweight rafts begat packrafting. Strap these rafts onto your bike as luggage and you have bikerafting. Of course, some of this has only become possible as equipment weights (and volume) have plummeted with the introduction of new materials and new ideas. It was not then without some interest that I listened to Andy of BackCountryBiking explain the "WindPaddle". 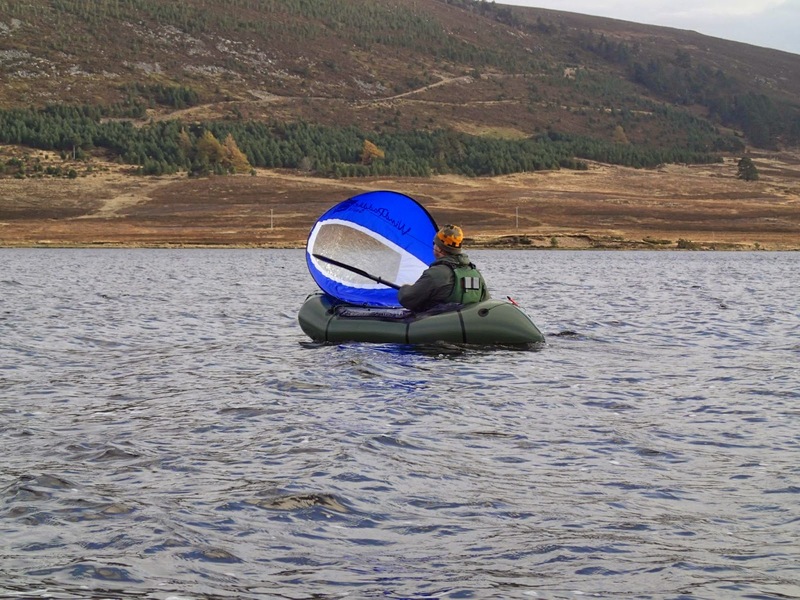 Here was a lightweight, pop-up (like those cheap tents) sail being used by some kayakers. With a little trial and error, he reckoned, it could also be used for cheap power on a packraft. I volunteered to do a little filming for him and a few weeks later we were arranging where to go. I guess the default is always going to be Loch Morlich but we fancied a wee change and opted for Lochindorb instead. It's not far away, it's a good bit bigger and, crucially, with a nice South-Westerly it would give us a decent run downwind if conditions were right. On the way there, we found that the southern end of the look looked really calm but driving round a bit our hopes were confirmed with a few decent waves visible. We walked back down the loch towards the "big house" and blew up the boats before experimenting with attaching and folding the sails. It all seemed straightforward enough so it was just a matter of paddling out far enough to catch a bit of breeze. Coming out from the shelter of the little peninsula provided that and I was just ready-ing the camera in order to catch Andys first attempt when he was off like a shot. I quickly packed the camera away again and unfurled my own sail in attempt to catch up. It soon became obvious that steering wasn't straightforward. My initial attempts using the paddle as normal were OK up to a certain speed but I was having to correct all the time. However, we made it to the little island without incident whereupon we did a bit of exploring and I got to sample Andys latest (potential) import - dehydrated beer. Yes, I know what you're thinking - that's got to be a wind-up, right? Well in this case, no. A little US company called Pats Backcountry Beverages has come up with a way of concentrating beer and then a way of diluting and carbonating it. Andy showed me the procedure and I had a taste or two. It's OK. Not the finest draught ale you'll ever try but it would certainly hit the spot on a hot day, or round the campfire with mates after a good days cycling or rafting.The final details of the import process are still being worked out but this could become a worthy contender for backpacking gear of the year. The van was still some distance away down the loch so we set off again, Andy showing me how he'd opted to use the paddle as a rudder, tucked under one arm. This was a much more effective strategy. 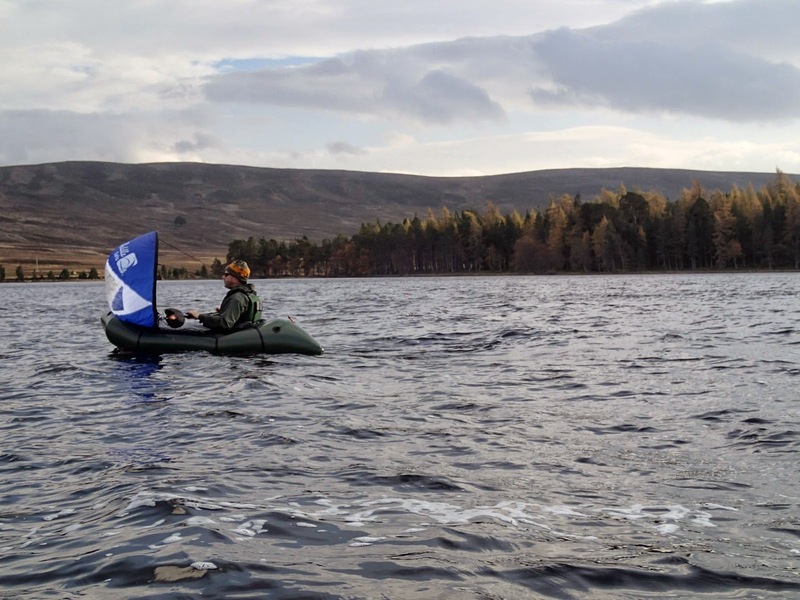 As we made our way down the loch our speed increased, as did the height of the waves, and it was soon a case of bouncing off each wave and into the next one and then trying to balance speed with direction to get back to the van. It certainly didn't take long to cover the distance and, with some daylight remaining, we opted to walk back up the lochside again for a second run. This time it was even better. Having got the hang of the technique it became a bit of a choice as to whether to head downwind as fast as possible, enjoying the sensation of free motive power, or tack across to the van. As it was, we both opted for more of the former, resulting in a bit of a cross-wind paddle to get back to shore. All in all, a great day for experimenting. The WindPaddles look like a no-brainer, providing easy motive power for little additional weight or bulk. The beer will certainly be a welcome addition to campfire chat. A big thanks to Andy for letting me try both. With that in mind, I've spent some time on easier walks or simply mooching around some fantastic spots in Scotland. Mim and I had a few days in Blair Atholl, including a walk up Glen Tilt. With summer flowers around and a lovely river to cool down in it was just about perfect. Summer is also about cream teas! The second week of our holiday was spent in the Western Isles. Though I've been through the Outer Hebrides before, Mim never has so we spent some time on North Uist doing some sightseeing, a couple of walks and some paddling in the new kayak. Horgabost beach. Does it get any better than this? I'd also long had a hankering to do a specific little walk, following the route set out in a Runrig song - Flower of the West. We headed up Crogary Mor on a mostly clear night and took in the sun setting over Corran Vallique before heading down with "Loch Aongais on our left". I even got to do my July bivvy-a month,, "escaping" from the campsite one night and heading for a long spit of land on North Uist. My initial plan had been to bivvy down at the trig point on the wee headland but it was thick with flies and I had to find a spot surrounded by sand to finally get away from them. It was a lovely location, with views out over the sea to Harris, but I was strafed by two large owls for 30 minutes or so. I don't know if it was me they were interested in or if there were lots of flying insects in my vicinity but it was fascinating and a bit uncomfortable to have them swooping so close to me. After a good nights sleep, I was rewarded by a fantastic sunrise. On my previous visit to North Uist, Paul and I had almost sprinted through on our way to catch the ferry to Harris. This time, in an almost perfect summer week, I'd finally taken the time to explore and experience it.